The HSM Securio P36c cross cut office shredder provides reliable and effecient shredding for your large office or department. The HSM Securio P36c shredder easily meets the demands of your business's productivity and security by offering a centrally located shredder capable of shredding up to 39 sheets of paper at once into level 2 secure pieces. The HSM Securio P36c even shreds CDs and credit cards and is unhampered by staples and paper clips. If your office needs a way to improve security and productivity, look no further than the HSM Securio P36c Level 2 Cross Cut Office Shredder from MyBinding.com today. Drive and operating concept IntelligentDrive. Intelligent paper jam prevention due to the intelligent paper jam prevention feature, the system recognises automatically and quickly whether too much paper has been fed in. The machine goes into reverse or increases the power temporarily and pulls the paper in. Operation via touch display. Operation via touch display with Intuitive operation and multi-language menu selection via the high resolution 4.3" touch display. Relevant information such as operating modes and status reports are displayed. Consumable material, machine and contact details can be called up. For continuous operation. Continuous Duty Operation ensures continual shredding with no down time. Solid steel cutting rollers with lifetime warranty. Cutting rollers made of hardened solid steel with lifetime warranty. Made in Germany. High quality materials and "Made in Germany" quality for safety and durability complete with a 3 year warranty. Equip to handle large jobs, this shredder can tackle entire departments at the maximum security level. Also shreds staples, paper clips, credit/store cards, CDs/DVDs. Equipped with Anti-Jam technology to easily and quickly reverse out paper in the event the machine is overloaded. $2 donated to Kids Kicking Cancer will be made for every SECURIO shredder sold. Inspection window to monitor filling level. Light barrier for automatic start / stop. Mobile on castors for shared use. Convenient and effortless removal and emptying of collection bag. Uses a 58 gallon capacity shred bag (Part # HSM2117) as an additional option. Good day and welcome to MyBinding video. Let's have a look at the Securio P36 by HSM. This is an awesome shredder perfect for entire departments and office floors. It comes in strip, cross, and micro cut forms. It's fast, easy to use, and very quiet. All the controls and plenty of information is right on the top. And the throat opening is 13" wide making anything possible. When it comes to shred capacity, strip cut can do 49, cross cut 31, and micro cut 20 sheets 20 pound paper in a single pass. CD's and DVD's are no problem for the strip or cross cut models, and all three can handle paper clips, staples, cardstock, laminated items, store cards, and of course, lots of paper. The motor and rollers are built to last. Should you have a jam, simply hit the reverse button, backs everything out, and you can start again. It stands almost 37" tall, is150 pounds, but is on four casters so it rolls around in the office with ease even on carpet. Swing open the door on the front and you have a 38.3 gallon waste container. Line it and let it go. And in terms of security level, strip does 2, cross 3, and micro cut a level 4 security. And that is the Securio P36 by HSM. For more demos, reviews, and how-to's, check out MyBinding.com. Every office needs a paper shredder these days to protect against identity theft and potential lawsuits. If you're looking for a good shredder for your shared work environment, the HSM Securio P36c This is a terrific machine that will undoubtedly impress you. We had a chance to try this device out and she how it rates on a scale of 1 to 10. Here's what we found out about it and its rating. 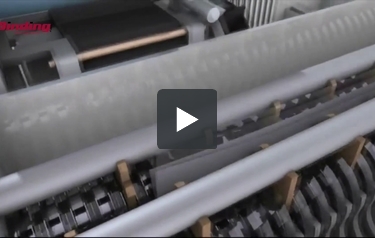 The Securio P36c is a cross-cut paper shredder. Thanks to its Level 3 security rating, it's good for shredding financial records, old correspondence, and other papers you need to dispose of. This device's cutting mechanism is strong enough to also destroy document fasteners (i.e. staples) as well as CD's, DVD's, and credit cards. There is a separate opening for CD's and DVD's. This makes the device safer to use. One of this machine's best features is its shredding capacity. You'll be able to shred up to 31 sheets at a time which is an excellent amount. Your documents can be up to 13" wide. HSM designed this shredder to be used in a shared workplace. The machine has a 38-gallon waste bin so it can be used frequently by several people. (The device has a continuous-duty motor.) Naturally, the Securio P36c is on the large size and has approximate dimensions of 23" (depth) x 22" (width) x 37" (height). Using the Securio P36c is easy to operate for beginners and experienced users alike. There is a control key you use to control the device as well as a rocker switch to turn the machine on and off. The machine also has an indicator to let you know how full the waste bin is. The Securio P36c was designed to help you save power. This is both good for the planet and easier on your wallet. Also, you won't see a lot of paper dust all over the place because this machine has a closed design to keep dust inside. This is a very well-constructed machine that you'll be able to get a lot of use out of. It even has a thermally protected motor so you don't have to worry about it overheating. The blades are made out of solid steel and are incredibly durable. The Securio P36c comes with a two-year warranty. Overall rating: 9. The HSM Securio P36c is a very impressive paper shredder that's an excellent choice for larger offices. This device has almost all of the features that the best shredders have including a high shredding capacity, the ability to shred CD's and credit cards, and a continuous-duty motor. This is in addition to a good security rating, easy and centralized operation, and its energy-saving design. Also, the Securio P36c is well-constructed and won't overheat due to its thermally protected motor. And it has a good warranty. If your office needs a shredder, make you check out the HSM Securio P36c. It may be the right machine for your shredding needs. Cutting Size 3/16" x 1 1/8" 1/16" x 9/16" 3/16" x 1 1/8" 1/16" x 9/16" 3/16" x 2" 1/16" x 9/16"